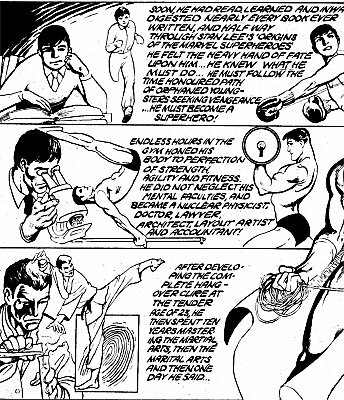 Powers/Abilities: Apart from his mastery of the martial arts and enough agility to swing across the city at night, the Crusader had no powers. He appears to have had an exceptional memory and near genius level intellect if he was able to become all the different professions listed in his origin before he turned 23. History: Young Perseus Ablemarle witnessed the deaths of his parents, shot by thugs in the street. At their gravesides he swore vengeance on his parent's killers, on gratuitous violence, and on the criminal classes in general. Soon he had read, learned and inwardly digested nearly every book ever written, and halfway through Stan Lee's 'Origins of the Marvel Superheroes' he felt the heavy hand of fate upon him...he knew what he must do...he must follow the honoured path of orphaned youngsters seeking vengeance...he must become a superhero. Endless hours in the gym honed his body to perfection of strength, agility and fitness. He did not neglect his mental faculties, and became a nuclear physicist, doctor, lawyer, architect, layout artist and accountant! "If I don't get on with it, I'll be dead of old age! "- And thus was born...THE CRUSADER! Having designed a costume and a grapple line, he went out on his first mission, seeking crime to fight late one night. Making his way across the rooftops of the city he spots some criminals loading radioactive material onto a truck, and swings down to confront the villains, crying out "Hold, Evil Doers! The hour of retribution is at hand..." just before one of the crooks machine guns him out of the air. The crooks then race off, leaving his body lying amongst the rubbish in the city street. Comments: Created by Alan Davis and Paul Neary. I've seen mention online that the Crusader's strip first saw publication in an issue of Frantic, but nobody, including Alan Davis, seems to be able to confirm this or cite the specific issue. The story was definitely printed (reprinted?) in Rampage Magazine #41 (November 1981). 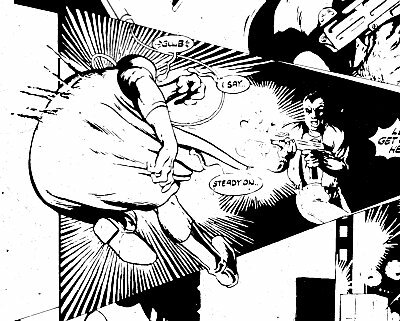 In case anyone reading the above hasn't realised, the Crusader was a spoof of all the self-taught Dark Avenger of the Night types that abound in comics. [bts] The Crusader survives his gunshot wounds, possibly due to his perfect physique making him quite resilient, and once healed, returns once more to the noble fight against crime. (fb, Marvel Superheroes #388) Unfortunately his luck remains true, and he falls victim to the hero-killing cybiote, the Fury. The Crusader's true name isn't explicitly stated in the story itself, but the final text panel asks the question "Were those who said 'You can't become a superhero with a name like Perseus Ablemarle' right? ", which strongly implies that this is his real identity. Profile adapted from the one I did for the Appendix to the Marvel Universe site. The Crusader, Christian zealot who battled Thor, @Thor #330. 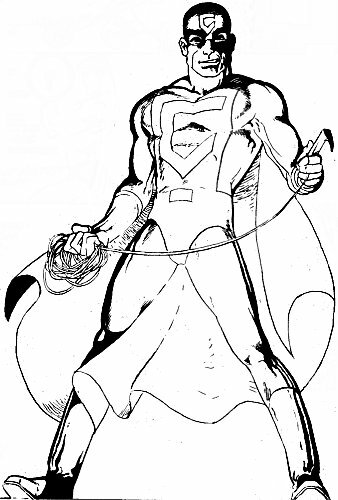 The Crusader, Robert Grayson, also known as Marvel Boy, original wearer of the quantum bands, @ Marvel Boy #1. Anyone else with the word Crusader in their name. Any other self-taught orphaned vigilante types who stalk the night seeking crime to fight.